On a recent afternoon in Caracas, dozens of people lined up outside Venezuela's Ministry of Communication, and waited patiently for their turn to get a tattoo of Hugo Chavez's signature. Members of a socialist artists collective called "Irreversible Revolution" gave the tattoos away for free to anyone who wanted to get one. And in three days some 150 people signed up. "I'm not going to regret this," said Monica Juarez, a young employee of Venezuela's communications ministry who had a Chavez signature with a little heart tattooed on the back of her neck. "I am simply stamping on my skin, what I already carry in my mind and in my heart." More than a month has passed since Hugo Chavez's death. But some areas of Venezuela are still awash with admiration for the socialist leader who ruled this country for the past 14 years. The ruling socialist party is trying to utilize this love for Chavez to win the presidential election that takes place on Sunday. And many analysts here accuse the government of fomenting a cult of personality for the deceased leader. "There's already a chapel in a densely populated area of Caracas, where Chavez is labeled a saint," said Ennio Cardozo, a political science professor at Venezuela's Central University. "And in the streets people are giving out small cards with Chavez prayers that depict him as a redeemer of Latin America's poor." It's hard to tell whether the government finances these initiatives. But the Venezuelan government has taken some unusual steps of its own to promote Chavez's image and spark admiration for the fallen president. Right after Chavez's death, socialist officials declared a week-long period of national mourning in which government offices were closed. The government then organized a series of massive events to remember the president's legacy and even promised to embalm Chavez's body and put it on display. That was until experts found out that the body was already too damaged for eternal preservation. Now on the campaign trail, the government's presidential candidate Nicolas Maduro permanently invokes Chavez's name. According to one site, Maduro has mentioned the revolutionary leader more than 7,000 times already in public appearances since his death. "I never wanted to be president, " Maduro said during a recent rally in Chavez's home state of Barinas. "If I am running it is because I am following the orders of the supreme commander Hugo Chavez." Maduro's campaign team takes giant screens to most of those rallies. And during his stump speech Maduro plays a video in which Chavez calls on voters to support him. Rallies begin with recordings of Chavez singing Venezuela's national anthem. When these events are not taking place, socialist party campaign tents that have been set up all over Caracas permanently blast out several Chavez songs. One is a recording of Chavez singing a patriotic song acapella style. Another song is a catchy campaign jingle that says "Chavez I swear to you, my vote goes to Maduro." Whether this qualifies as a cult of personality or not, it is an effective campaign strategy, according to Venezuelan pollster Luis Vicente Leon. "Chavez has far more popularity than Maduro, and is much more loved by the masses," Leon said. "So I think [Maduro] is following a rational strategy." Ennio Cardozo said that there was a short time between Chavez's death and the special election to replace him so the best thing that the largely unknown Maduro could do, is to portray himself as the "custodian," of Chavez's legacy. "Chavismo needs to keep the president's image alive because he was the one who built an emotional connection with the electorate, not Maduro,"Cardozo said. "This is essentially an election between Chavez and (opposition candidate) Henrique Capriles." Maduro currently leads Capriles by 10 points or more in most polls, even though in his brief time as the acting President of Venezuela, the country has faced serious food shortages, power blackouts, and high inflation rates. But Cardozo believes that such heavy reliance on a supreme leader could eventually backfire for Maduro. He says that, even if they win the upcoming election, Venezuela's socialist leaders will have to do more than promote reverence for Chavez if they want to hold on to power. "If the public policies that they pursue do not meet the demands of society there could be [severing of ties] between Chavista voters and their leaders," Cardozo said. Still, the young people getting Chavez tattoos at the ministry of communication said it would take much more than some economic problems for them to lose their faith in Chavez and his socialist revolution. "He's the first president who comes from the people, and who we identified with," said Cerecita Olavarrieta, one of the organizers of this week's free tattoo sessions. Olavarrieta said that she came from a poor neighborhood in Caracas, where her family had experienced hunger and repression under previous governments. 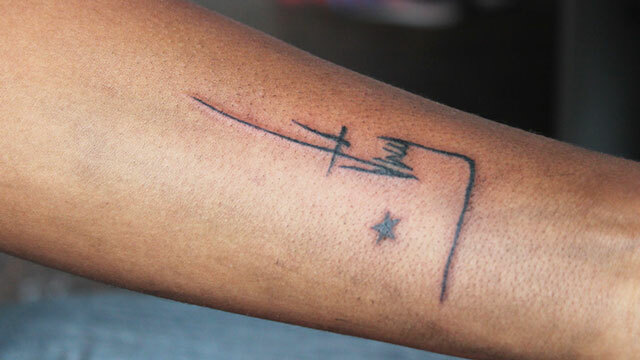 She said that she is forever committed to Chavez and his revolution, and added that there was nothing extreme about getting Chavez tattoos. "Chavez was love and he gave his life for us," Olavarrieta said. "What we are doing here is not exaggerated, it is a vindication of our struggle."